Few writers have demonstrated versatility with regards to artistic medium like Alex Garland. The English writer had three novels and five screenplays on his resume before making his directorial debut with 2015’s Ex Machina. With its small cast of breakout stars (Domhnall Gleeson, Oscar Isaac, and Alicia Vikander), Garland’s science fiction thriller became a surprise hit. It grossed almost $37 million worldwide, winning the Academy Award for Best Visual Effects (beating three Best Picture Oscar nominees and a Star Wars saga entry in the process) while also garnering Garland a Best Original Screenplay nomination. For his sophomore directorial outing, writer-director Garland shifts to adapting the 2014 sci-fi horror novel Annihilation, the first entry in Jeff VanderMeer’s Southern Reach Trilogy. Soon after completion, those anticipating the movie grew anxious when reports of poor test screenings in the summer of 2017 led Paramount financier David Ellison to insist on script changes to generate broader audience appeal. Producer Scott Rudin, who had final cut, sided with Garland’s vision in opposition to Ellison. In the end, Netflix stepped in, resulting in a disappointing compromise—theatrical releases in the U.S. and China, instant streaming everywhere else. Such a shame this distribution kerfuffle had to afflict one of 2018’s most breathtaking and cerebral films. Lena (Natalie Portman), an U.S. Army veteran who now works as a biology professor at John Hopkins University, is troubled by the year-long disappearance of husband and Army soldier Kane (Oscar Isaac). Kane then reappears out of nowhere, but Lena senses that not all of her husband has returned; worse yet, he is spitting blood. En route to a hospital, both get abducted by a government organization known as the Southern Reach. The organization takes them to psychologist Dr. Ventress (Jennifer Jason Leigh), who runs the Southern Reach compound at the edge of a enigmatic zone known as “Area X” or “The Shimmer”. The Shimmer threatens to expand from its coastal swamp location to cities, states, and so on. The organization sent drones and male-dominated military units into the Shimmer, but other than Kane, nothing has returned. Dr. Ventress chooses to lead a team consisting of paramedic Anya Thorensen (Gina Rodriguez), physicist Josie Radek (Tessa Thompson), and anthropologist Cass Sheppard (Tuva Novotny) into the Shimmer. Seeking a potential cure for her comatose husband, Lena volunteers to round out the team of female scientists. All five ladies know very well that the will to find answers within must overcome their fear of never getting out. Writer-director Garland sets an early and lofty bar for cinema in 2018 with his adaptation of Jeff VanderMeer’s 2014 novel. 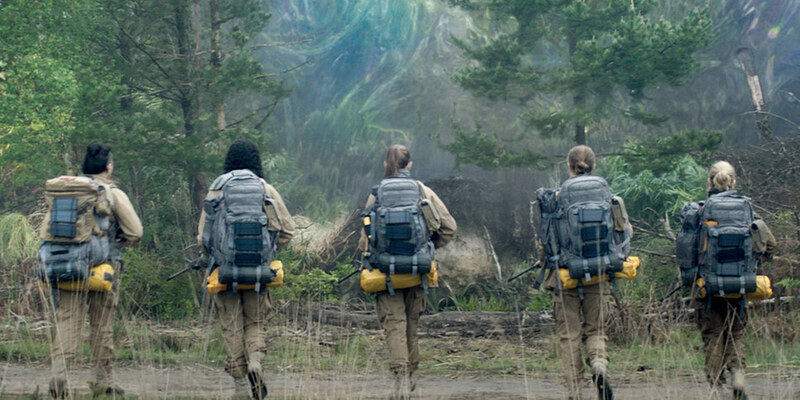 As with Ex Machina, Garland’s bold and coldly-composed vision suits to perfection the high-grade science fiction of Annihilation. Some scenes even serve well-poised horror that avoids cheap jump scares while also wading into found footage territory. One could argue that Annihilation’s horror scenes alone surpass the entire runtime of January’s Insidious: The Last Key. Each member of the all-female cast, led by Natalie Portman, receives ample screen time to display their acting chops, in particular the subdued and fatalistic Jennifer Jason Leigh and the feisty Gina Rodriguez. Sara Bennett and Andrew Whitehurst, two members of Ex Machina’s Oscar-winning visual effects team, collaborate once more with Garland to supervise the creation of the foreboding Shimmer. The results on screen reflect the talents of effects specialists at the top of their craft. Unless the coming visual effects efforts of 2018 far outpace that of Annihilation, the Academy’s Visual Effects branch have little reason next winter to not nominate Garland’s movie for the Visual Effects Oscar. It would not surprise me if, in addition to reading VanderMeer’s 2014 novel, Garland sought inspiration from two sci-fi cinema gems from 1979—Andrei Tarkovsky’s Stalker and Ridley Scott’s Alien. A spiritual grandfather to Annihilation’s “Shimmer”, Stalker’s “Zone” preys on intruders who stray too far and too long from the path and carries answers at its core that would disturb even the brave. Stalker sets the abrupt border of its Zone between a sepia-toned world and a world of color; Annihilation draws a sharp line by having Portman and the others emerge disoriented from their tents, having somehow spent three days in the Shimmer with no recollection of having done so. As for the Alien connection, Oscar Isaac’s character Kane shares the same name as John Hurt’s Alien character with an infamous fate. Both Kanes enter an unknown area and reemerge forever altered by an unknown phenomenon, devoid of any discernible motive or conscience, functioning on pure subsistence. Legitimate cinematic ties or not, the overall effect is bone-chillingly mesmerizing. It stuns me how great of a lead Annihilation takes at this point with regards to cinema in 2018. At the same time, it worries me that the aforementioned distribution dispute might cause a positive legacy to escape Garland’s film. Yet even with Barney Pilling’s patient and challenging editing, Annihilation already deserves to number among 2018’s best, no matter how better or worse the rest of the year’s new releases fare.